Here are some behind the scenes videos and photos of my film Accumulonimbus. The photo above shows a bunch of the props I made for the film. When possible, I made rubber molds of objects that needed to be duplicated. For some of the pipes I cast real plumbing parts. Once the molds were made, I heated the clay up in a pot on the stove. It melts within a couple of minutes, and I had to be careful not to cook it too long, otherwise it smelled horrible and I got a headache. Once the clay was liquid I poured it into the mold to make the cast. I then put the molds in the freezer so they solidified quickly. Here is the raw footage of the animation I shot, before I matted it in the circle and adjusted the picture. Some parts were shot in passes, so I could composite them later. These trees overlap. Rather than setting up a multiplane, I decided to do my layering in Adobe After Effects. At this stage in the process I started shooting everything on a green screen. This made it easier to composite images, and to fix any mistakes I made. Here are some storyboards/animatics that I made in flash. I tend to board directly into flash because I like to see motion as soon as possible. Some parts of the movie were highly planned, and others were more improvised. About half of this movie was made using an old version of Stop Motion Pro. Eventually I switched over to using Dragon Stop Motion. This program is fantastic, I can't recommend it enough. One great feature of the program is that it allows you to load a reference quicktime and overlay it on your video screen as a motion guide. Here is an iphone video my friend shot where you can sort of see the process. The end sequence was complicated, and I planned a lot of it out before hand in After Effects. Here is the reference video for what I call the spaghetti street. Once that was complete I added motion references for the houses and the pipes, and split it into 3 passes for shooting. This is part A. And here is what I shot. I also worked out how the rings would vanish at the end in the computer. 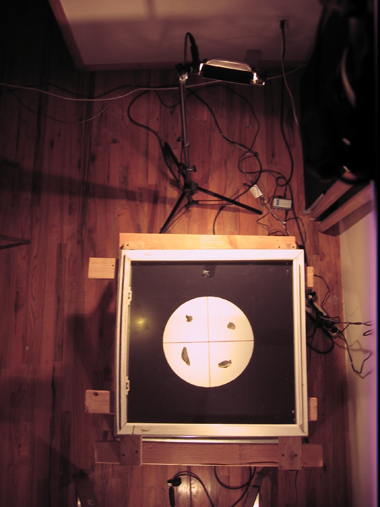 This was my animation setup in my apartment in Brooklyn. For lights I used a Lowel Tota, a Lowell Pro Light, and a cheap hardware store flood light. A view of the table from the ladder. The red string was used to find the center of the glass circle. I removed it after taking this photo. I built a table that could rotate, since that happened a lot in the film. The glass is a window I found on the street. I bolted it to a bicycle rim I wasn't using. Then I built a frame out of 2x4s and attached it to two saw horses. 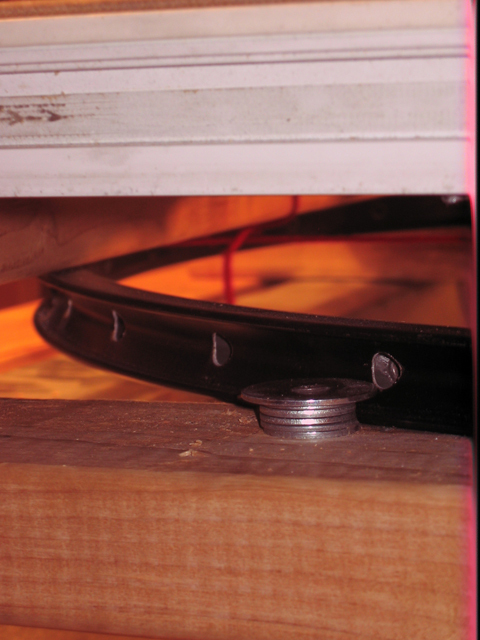 There are 4 screws with washers around them that serve as a track for the rim to spin on. When this photo was taken I was using white paper on the ground for the background. Since I had a light pointed directly on the paper, it was bright enough to be slightly overexposed. The advantage was that most of the smudges on the glass were blown out, and I got the white background I want. Later in the process I put a green sheet of paper down to key out the background. I mounted some 2x4s to the wall, and attached my camera to them. This was my camera setup for the first half of the movie, a Canon Rebel XT for the high res final image. The lense is an old manual Nikon Macro lens. At first I used a unibrain firei board camera for my frame grabber. Using a video assist gives me live feedback and lets me test out motion as I work. It was bolted to a piece of foam core, and then attached to the flash mount of the Canon with a couple of brackets. Not the most elegant solution but it worked for a while. I would take two pictures, one with the fire-i camera using stop motion pro, and another with the Canon SLR using the remote utility. When I started the film affordable digital SLRs with the live view function were just starting to be on the market, so I had to figure out this clunky solution to get a live video feed with an SLR. Eventually the firewire board camera stopped working. I decided to upgrade and I bought a Canon Rebel XSI. This camera has live view, so I no longer needed to use a secondary camera for my video feed. The live view feature allows you to have a video feed straight from the camera. I bought the Dragon Stop Motion software which is optimized for Canon Live View cameras, which made my life a whole lot easier. I highly recommend this setup for stop motion. Feel free to email me if you have an questions about my setup/ gear/ etc.